TAMassociati is the winner of the ZumtobelGroupAward 2014 – Building Category – with the Port Sudan Paediatric Centre. 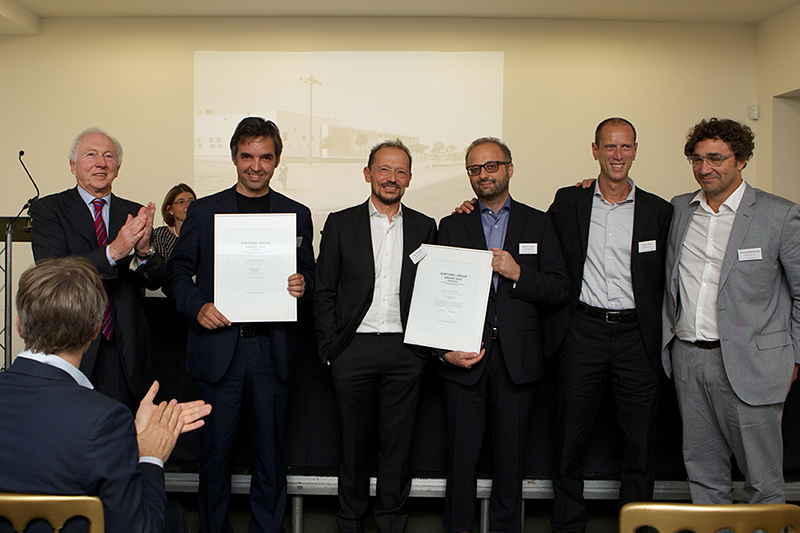 Zumtobel Group Award Ceremony in London: Jürg Zumtobel with Studio TAMassociati Italy, winners in the Buildings category and Studio Urban-Think Tank Zürich, nominated in this category. Jürg Zumtobel with winners (TAMassociati, Arup, Elemental) in front of the Serpentine Gallery in London in occasion with the Award ceremony.London / Dornbirn – The international expert jury for the Zumtobel Group Award 2014 has selected projects from Arup of Germany, Studio TAMassociati of Italy and Elemental of Chile as the winners in their respective categories. The results were announced by the chairman of the jury Winy Maas and jury member Kunlé Adeyemi at a press conference last night. To promote innovations for sustainability and humanity in the built environment, the Austrian lighting group had invited submissions for the award in three categories: APPLIED INNOVATIONS, BUILDINGS and URBAN DEVELOPMENTS & INITIATIVES. The jury had initially selected 15 projects as nominees from among the 356 submissions for the fourth Zumtobel Group Award, which was again curated by Aedes Architecture Forum in Berlin. The winner of the Zumtobel Group Award 2014 in the BUILDINGS category is the Studio Tamassociati architectural practice from Venice. They were commissioned by the Italian NGO “Emergency”, which provides free medical treatment to civilian victims of war, landmines and poverty, to build a children’s hospital in Sudan. Located in the strategically important city of Port Sudan, the clinic is one of the few facilities to provide free care for children in the region. In the prevailing extreme conditions – the hot desert climate and the political instability of the country – simplicity was the overriding design principle. Relying on the use of new and old technologies, the architects developed a system for cooling, air treatment, recycling, reallocation of local materials, landscape design and energy saving. The need to purify waste water from the centre presented an opportunity to build public gardens, which are the only public spaces around. These gardens represent an important part of the healing process for patients.